With fruit season going into full swing at Laughing Heart, it was time to get prepared for the abundance. Of the boxes of nectarines, peaches, now plums, and soon the next fruiting trees, we have been coming home from harvest with lots of very fine-looking fruits and as many or more fruits bruised or with bird-pecks or generally unsellable. As blemished as they may be, these damaged fruits are perfect for drying. Our dehydrator is composed of 2 main parts: the trays and the supports. Here’s how we made them. Each tray is composed of 3 layers: a rigid bottom layer made from stiff fencing, a middle layer made of closely-spaced flexible fencing, and a top layer made of soft, washable window-screen material. The photo above shows the bottom-layer of each dehydrator tray with large-spaced, heavy-gauge wire fencing. 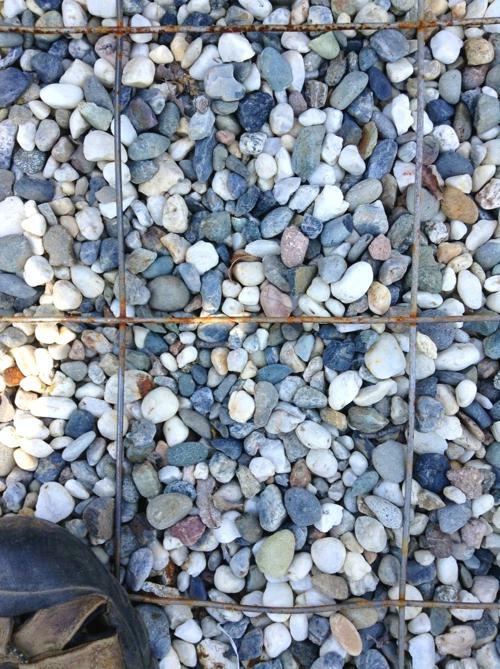 This type has 6 inch squares (the tip of a shoe is shown for size). 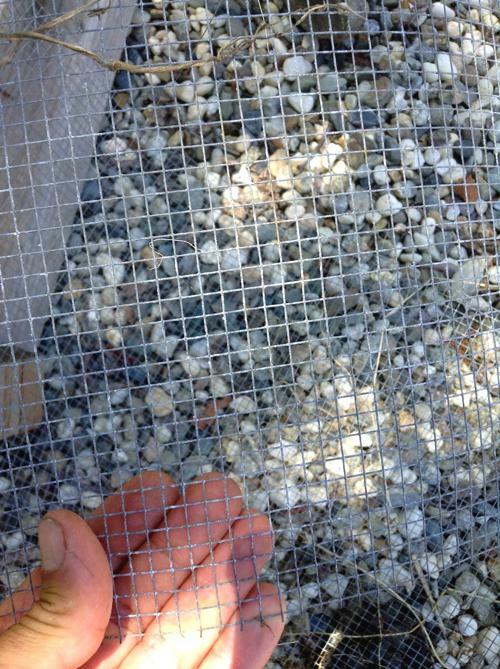 This photo above shows the middle layer of the dehydrator tray which is composed of small-spaced, light-gauge wire fencing (the type with ¼ inch squares). 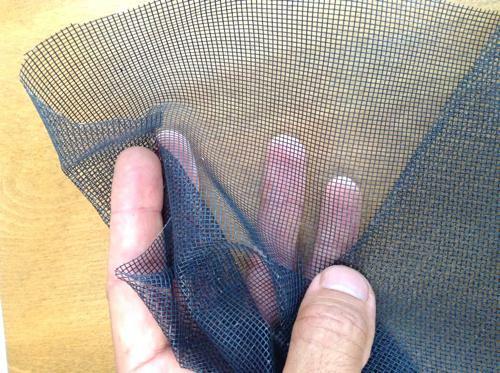 Here is a photo of the top layer of the dehydrator tray which is a tightly-spaced mosquito mesh. For the bottom layer, cut 2 foot wide squares from the heavy fence material. For middle layer of fence material, cut it several inches larger than the bottom layer and then wrap it around the bottom layer. Use a hammer to smooth out the bumps. 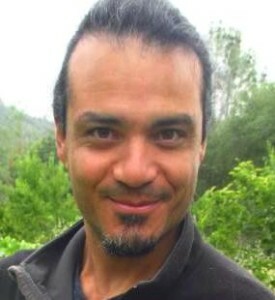 At this point, bottom and mid layers will be permanently connected. For the top layer, cut at 2 foot squares and lay one on top of each connected bottom and mid layer. This top layer is meant to be removed for cleaning. Once all trays are assembled, crimp an ‘S’ hook at each tray corner. The photo below shows finished the tray layers with the chain supports. 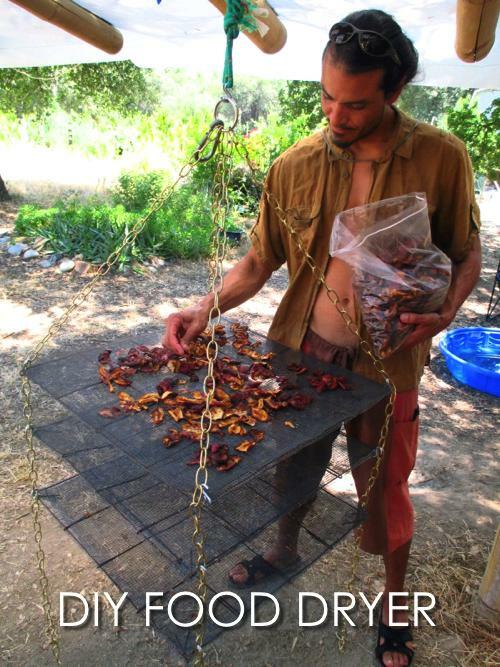 The supports are essentially a system of chains and loops which offer quick hanging and adjustments of the trays. At the top is a metal hoop (shown hanging on ‘S’ hooks in the photo below). 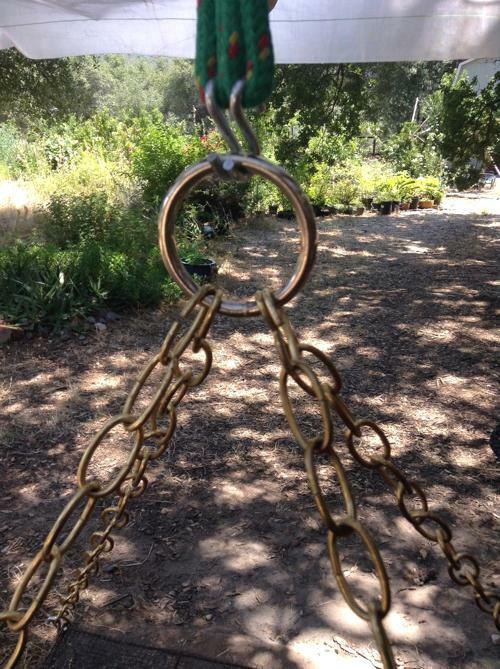 Attached to it are four equal lengths of chain. 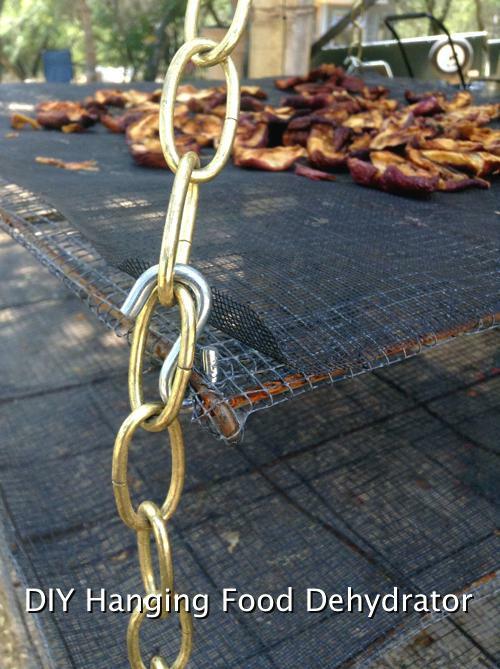 We made ours with about 4 foot long chain at each corner to allow for many trays. That’s really all there is to it! Since we are on solar power and have plenty of it during the summer, we added a fan to the mix. Cut up fruit in largish chunks as they will shrink dramatically (experiment and see!). We had thought flies would be an issue, but they haven’t been. Our next layer to the system would have been a mosquito net to cover everything, but it hasn’t been necessary. Bees were attracted to the still wet fruit but they weren’t a problem. 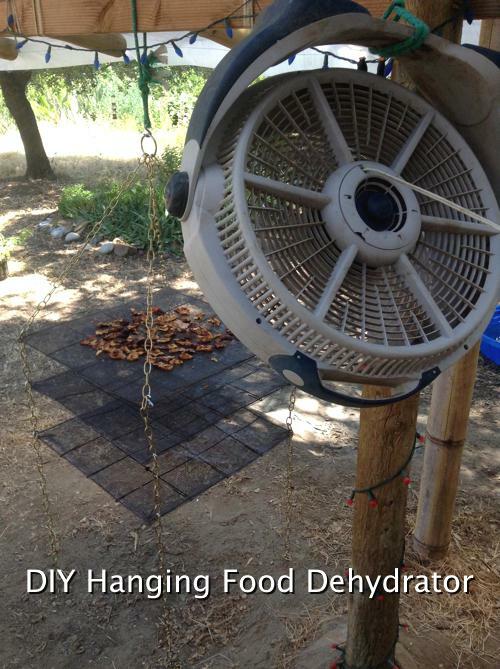 I keep the dehydrator out of the sun. On average fruits are taking about 3 days with the use of the fan. The purpose of the fan is to send a constant stream of dry air over the fruit. It definitely speeds up the process, but it is not a necessity. This is an effective, inexpensive, compact, and portable, dehydrator capable of supporting many pounds of fruit. 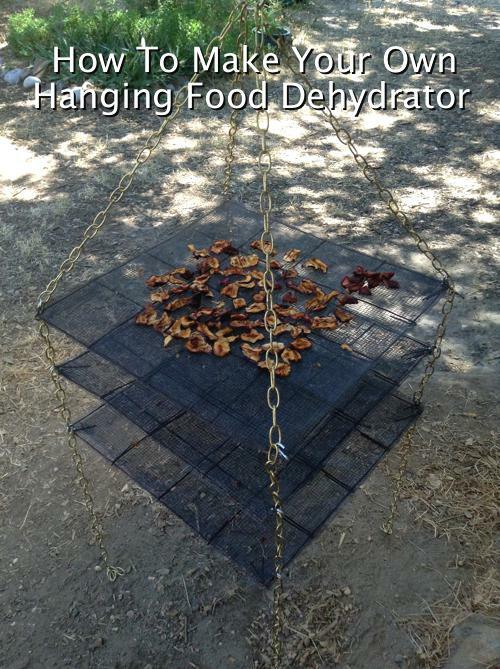 Being on a farm with lots of spare material, it was easy to find the parts to make this dehydrator. However, what I have presented here is really meant to inspire your own creative approach.